First-time presenters Lucas Callaghan and Adam McDonald make their TV debut as our very own Aussie Pickers next month on A&E. 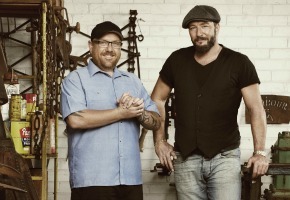 The 8 part Shine Australia production is an adaptation of the US series, American Pickers. Join Aussie Pickers Lucas Callaghan and Adam McDonald as they travel around Australia looking through attics, backyards and sheds in the search for forgotten relics. During their search for treasures Lucas and Adam meet some of Australia’s most iconic characters with more than a good yarn to tell. Picking their way through Toowoomba in Queensland, Wagga Wagga in The Riverina and Northern NSW through to Victoria and Tasmania, what the boys find may set you on your own treasure hunt. It may be your door they knock on next. Thursday May 9 at 7.30pm on A&E. I would call it more of an imitation than an adaptation of American Pickers. I think I’ll stick with Mike, Frank and Danielle.